I have been interested in politics for a long time. When I heard about WYP I was keen to get young peoples voices heard. I have a strong connection with the LGBTQ+ community so want to play my part in making sure the community is heard. I will get the views of other young people through social media. I will contact LGBTQ+ organisations throughout Wales to explain this position, finding out what issues they want me to raise. I will ensure I feedback to these organisations after any WYP meetings and events and get their views before I attend WYP. I have been a representative on Caerphilly Youth Forum for over 3 years. I have a lot of experience in being the voice of young people, making sure issues are raised and addressed. I have worked on many projects such as setting up a LGBTQ+ group in the Youth Service, a mental health awareness campaign and I’m currently working on an anti-bullying campaign #byebyebystanders. 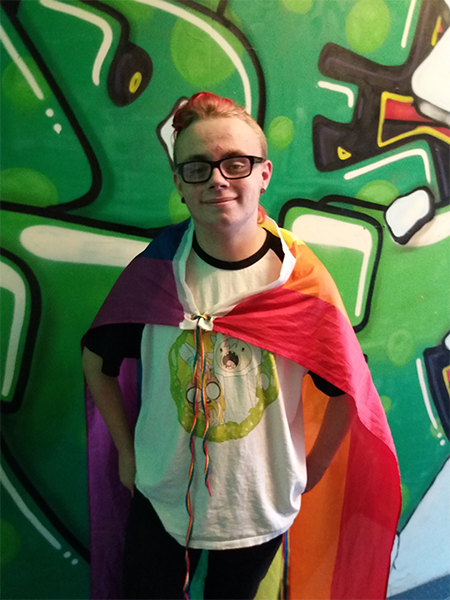 I look forward to being the rep for Caerphilly Youth service and particularly the LGBTQ+ community.